Well, they always said to live every day like it's your last. When you woke up this morning you didn't realize that you'd find Death at your kitchen table, helping himself to a cup of coffee. For a guy with such a serious uniform, he's actually not as grim as people have made him out to be. He has quite a fresh bedside manner. Anyway, you have that big Halloween party to go to so you asked him to come along rather than take you at that very moment. Even though he was planning on taking you to the great beyond before lunch how could he refuse an invite? It's not very often that Death gets invited to the party and he doesn't want to lose the soul he came with so you guys will have to remain close all evening. At least you didn't have to spend your last day in the land of the living figuring out a costume. In fact, your last Halloween guise might be the best one yet! Before you start pushing up daisies you might as well enjoy yourself. You can park where ever you want and actually enjoy getting tickets you'll never have to pay. You can eat that crazy French fry and ice cream concoction you dreamed up but always thought was too decadent to order at a drive through without blushing. You can skip work and schedule a massage for you and the hard working reaper. Yeah, and maybe you'll want to say goodbye to you loved ones if you have time. In this Reaper costume you'll be the life of the party. 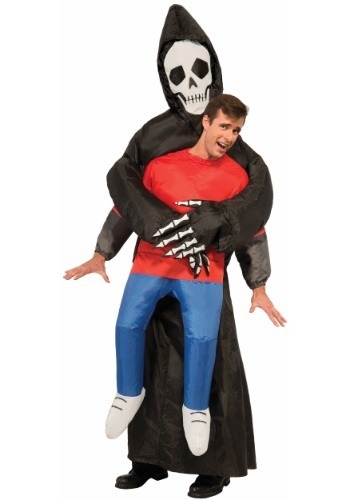 The inflatable costume makes it look like you're in the grip of death all night. Perfectly macabre for Halloween, you'll take this unforgettable night to the grave.